A "mystery manuscript" which has been held in Trafford Archives for more than 120 years has finally been identified. Dr Tilman Frasch, a lecturer at Manchester Metropolitan University, said it was a rules manual for Buddhist monks dating back to about 1850. 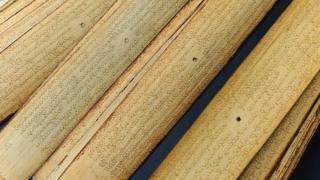 The piece, written in the ancient Pali language with Burmese translations, is made of palm leaves treated in oil. Trafford Council has called the Burmese history expert's help "invaluable". Image caption The Manchester Metropolitan University lecturer said interest in Eastern religions and Buddhism in particular "was always high"
Karen Cliff, from Trafford Archives, said: "While we were back-cataloguing objects we found the manuscript in a box, but we didn't know what it was, other than that it was some kind of religious text - we couldn't read it. "Our mission now is to find out how it came to us - we will look through the archive minutes and it would be nice if we could give it a little more provenance."